Home is a special place for me. It’s a place where I don’t have to wear make-up or wash my hair. There’s no need to impress anyone or put up a pretty front: the cats don’t care and my mom and dad aren’t that picky either. It’s a place where I always have someone to talk to when I’m angry or upset; all I have to do is pad into my parents’ room and lie down on the empty side of the bed beside my mom. Home for me is a great big Victorian house on the main road of a rural town. It was built in the 1800’s and holds about as much history as the local museum, which happens to be just across the street. I remember the very first day we moved in to that house. It felt so big to my nine year-old self, like I would get lost if I wasn’t careful. My parents allowed my sister and I to pick our own rooms. Of course, my sister chose the big one in the main section of the house, but I wanted something a little more unique. Set off from the rest of the house was a narrow room with slanted ceilings and a skylight that opened up to the stars at night. It even had its own set of slender wooden stairs that led down to the kitchen: the perfect passageway for a midnight snack, or as my mom used to say, an escape route for boyfriends when I got older. It used to be the maid’s quarters when the house was built, but it became my room. Over the years my room changed, and I changed with it. The pink walls and flowery wallpaper vanished when I turned 12, replaced by a creamy yellow that remains there today. The lack of size and beauty in my former one-storey bungalow was certainly made up for in my new home. This house had two living rooms, one with a marble fireplace to hang my stockings from at Christmas. It had a cozy little den to watch movies in, and a kitchen with a wood stove that heated my body from the inside out, the kind of warmth you can only get from slowly burning logs. But the best part of the house wasn’t in the house at all. Surrounding my new home were acres and acres of field and trees, and a huge yard to ride my bike in. I spent most of my childhood out there, creating forts within the shadowed enclaves of birch trees and fragrant maples. I was free there, chasing after my dog on warm summer afternoons, seeing who could get to the blueberry field faster. It’s been four years since I moved out of that house, but it will always be my home. Whenever I go home to visit my parents, I make sure to unpack my suitcase and put all my clothes in the dresser, even if it’s only a weekend trip. There’s something unnatural about living out of a suitcase in your own home. I went home last week for March Break and spent a whole week and a half basking in the warmth of the wood stove and the company of my mom and dad. I walked down in the field that I used to love so much, taking in the smells of the first peek at spring. I huddled in my little yellow bedroom, reading into the wee hours of the night, knowing I didn’t have to get up the next morning. While I was home, I made my parents a batch of chili I came across in a recipe book in the clearance section of Chapters. This chili particularly caught my eye because the cookbook was for chocolate recipes, so I knew it had to be good. The cocoa powder really richens the flavour of the beef, and it smells delicious. This recipe has a lot of ingredients, but it takes less than an hour to make, and is well worth it. Chop onions finely. In large saucepan, heat oil, then add onions. Cook, stirring often, for three minutes. Add thawed ground beef and cook until brown. Drain out any excess liquid in the saucepan and discard. Add cocoa, chili powder, cayenne pepper, salt, allspice and cinnamon to saucepan and mix well. Add cans of tomatoes (undrained), tomato paste and water and heat to a boil. Reduce heat and let simmer for 30 minutes. 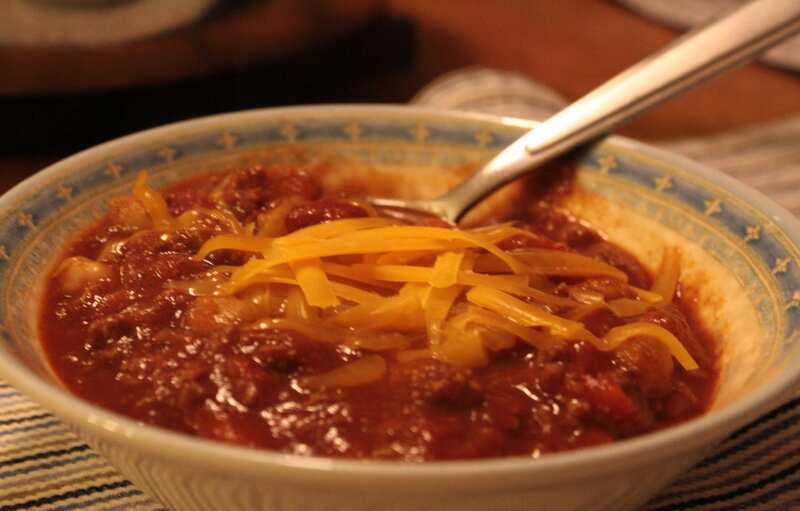 Serve topped with grated cheddar cheese and chopped onion if desired. My dad’s a quiet man. He’s not the type that commands attention when he walks into a room, let alone ask for it. He grew up on Prince Edward Island, a rural province that treasures humbleness as much as its rich, red soil. He’s soft spoken at times, but he always makes me laugh, something I’ve always counted on him for. Growing up in a small town, my dad wasn’t like all the other dads I knew. When I was a kid, he spent his weekends bringing my imagination to life, whether I wanted to turn the kitchen into a restaurant or the backyard into an Olympic stadium. He picked me up when I fell off my bike and pulled my sled to the top of the hill on those cold winter days when I was too tired to walk back up. He never thought twice before leaving work early to pick me up from school whenever I was sick. With him, I always came first. In the evenings, my dad listened to classical music and read The Globe and Mail. He drove me to dance class and helped me with my math homework. My mom did most of the cooking, but every once in a while, he would pitch in. His speciality was corn chowder. I always think of my dad when I make this chowder. I think of him frantically cutting onions and peeling carrots, desperately trying to get everything in the pot so that we could eat by 6:00 p.m.
Dad always worked so hard to make everything perfect for me, so that I never had to want something I couldn’t have. And even though I’m living on my own now, he still takes care of me, in whatever way he can. He reads Chatelaine and recommends articles I might like or recipes I should try. He calls me every week to make sure I’m doing okay. Whenever I go home, I can always count on finding a fridge stuffed with all my favourite food. Like most men of his generation, my dad has a hard time telling me how he feels. Instead, he finds other ways to show me that he cares. Whether it’s by stocking up on mangoes and cantaloupes before Christmas break or wiping last night’s snowfall off my car’s windshield, he always makes sure I know that he loves me. 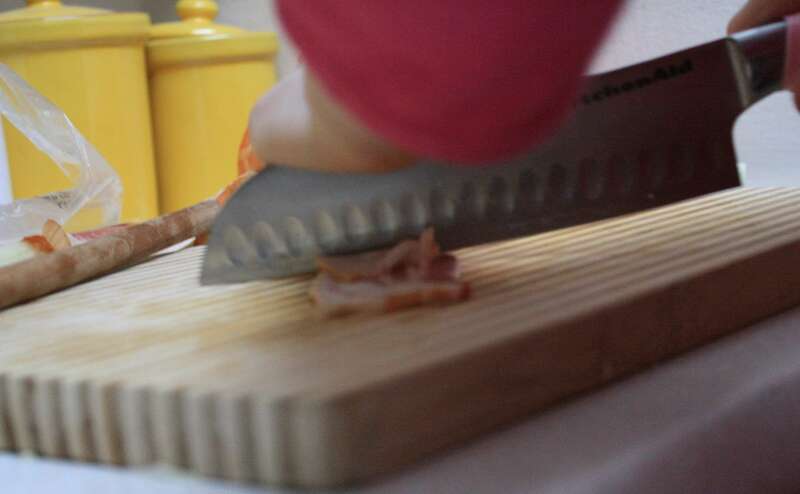 Chop bacon into small pieces, about one inch. Fry until crispy in large pot. 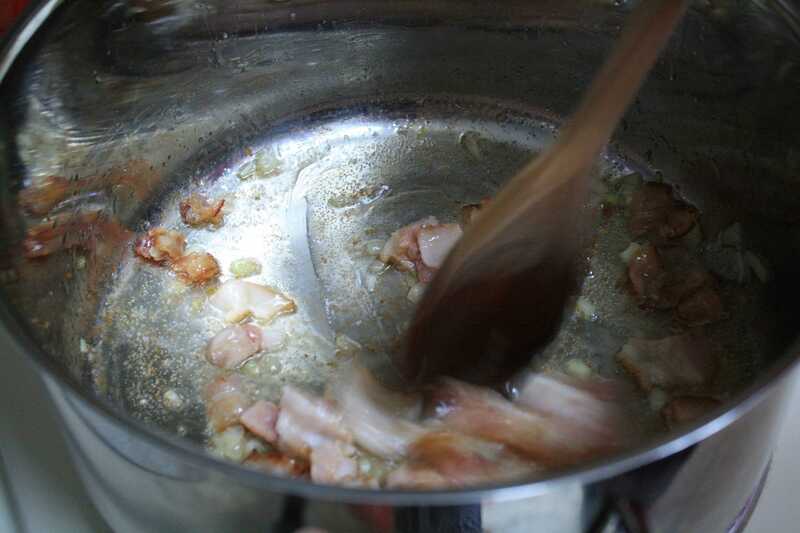 Slice onion and fry with bacon, stirring often, for five minutes. Add cubed potatoes and two cups of water. Slice carrots into medallions and add to pot. Cook until vegetables are tender, about 30 minutes. Add cream style corn and milk. Stir and heat (don’t boil) for about 15 to 20 minutes. Before serving, add butter, and salt and pepper to taste. Stir well. This chowder is best served with my recipe for tea biscuits. I never really knew my grandmother on my mom’s side of the family. I have a hard time even calling her my grandmother, a term so precious because of my relationship with my dad’s mom. The name holds meaning: something I never derived from my relationship with Mom’s mom. She had Alzheimer’s and barely recognized who my sister and I on the rare occasions we went to visit her. I only have one memory of her, and for the longest time I thought it was just a dream. I’m sure my parents explained who she was, but to my seven year-old self, she was just some strange lady sitting in a nursing home bed talking to my mother. I remember she gave me and my sister a wooden lap desk. It had ducks or loons embroidered on the cushion, and the flat desk side was white. I treasured it the way kids do with things they know are meant for adults but are given to them anyway, as if somehow I was supposed to keep it safe until I was old enough to appreciate its use. I never saw her after that one visit. A couple years later my mom went away for several days. I didn’t know it at the time, but she was at her mother’s bedside, watching her die. I didn’t really understand the concept of dying, nor did I understand that the woman who had died was my grandmother. Growing up, my mom would always make beef stew with dough boys. It was my favourite, but she only made it once or twice a month. 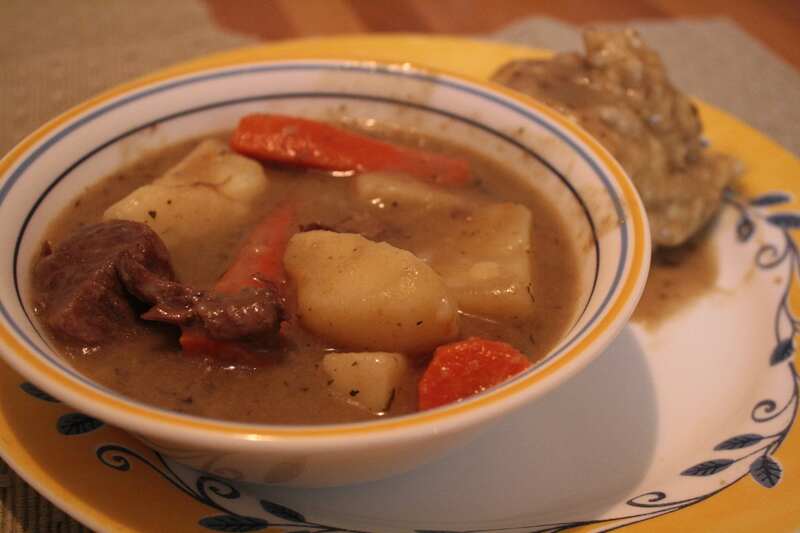 When I moved out and started cooking for myself, the first recipe I asked for was Mom’s beef stew. I’ve been making it for over a year now, but I had never bothered to ask my mom where the recipe came from. As it turns out, the recipe was passed down to my mom from her mother. Her mother never liked to cook, she said, but every couple of weeks she would make this beef stew, and like me, it was my mom’s favourite. My mom started making the beef stew when she was first living on her own. She made it the very first time my dad came over to her house, before they started dating. Food brings people together; not just in body, but in spirit too. I always wondered about my mom’s mother, about what kind of woman she was and if she would have liked me. And even though I was never given the chance to find out, knowing that it’s her beef stew I’m making helps fill that gap, if even just a bit. In mixing bowl, stir together flour, salt and pepper. Rinse thawed beef chunks under cold water and roll in flour mixture until coated. In large pot or dutch oven, bring oil to a simmer. Add floured beef chunks, stirring until lightly browned. In the other mixing bowl, stir together beef stock and water. Add to pot and stir. Add finely chopped onions, bay leaf, summer savory and peeled and whole carrot. Crush garlic with side of knife and add to pot. Bring to boil. Reduce heat and simmer gently for two hours. After two hours, peel and chop potatoes and carrots and add to stew. Add more water to cover vegetables. Simmer 40 minutes to an hour, or until vegetables are tender. Five minutes before serving, stir flour, baking powder, sugar and salt in a medium mixing bowl. Add water and egg at once, then stir until combined. Drop by the spoonful into stew, leaving room for them to rise. Cover and cook for three to five minutes, turning dough boys at the half way mark. 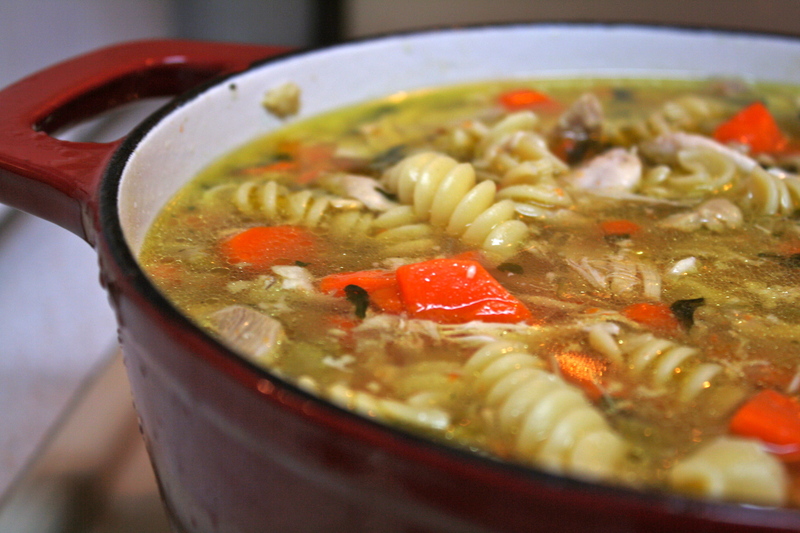 There’s something comforting about chicken noodle soup. Its warm broth slides down your throat with ease, warming your body from the inside out. The smell filled my tiny two bedroom apartment for hours, making it feel like home. My boyfriend has a bad cold, so after listening to him cough and hack all day, I took my sweet release from the apartment to get groceries. I wanted to make him homemade chicken noodle soup, the ultimate cold medicine, so I stocked up on all the ingredients to make a healthy, hearty broth. I got a little carried away in the grocery store and bought way more groceries than I could carry and ended up relying on the assistance of some godly woman who offered to carry one of my bags all the way to the bus stop. When I got home, I realized I had bought the wrong kind of chicken. The recipe calls for boneless, skinless chicken backs or necks, but I picked up bone-in, skin-on chicken thighs. Rather than risk death by choking, I painfully cut the bones out of all 10 pieces of chicken. Now I understand why people become vegetarians. There’s something unsettling about peeling flesh off an animal’s bones with the understanding that I’m going to eat said flesh, but I kept going. I wasn’t going to let my squeamishness get in the way of cooking. Despite my novice mistakes, the soup was incredible. By cutting up the chicken to remove the bone, the chicken broke into smaller pieces which I left in the soup for more texture and flavour. Rinse chicken pieces under cold water and place them in one of your large pots. 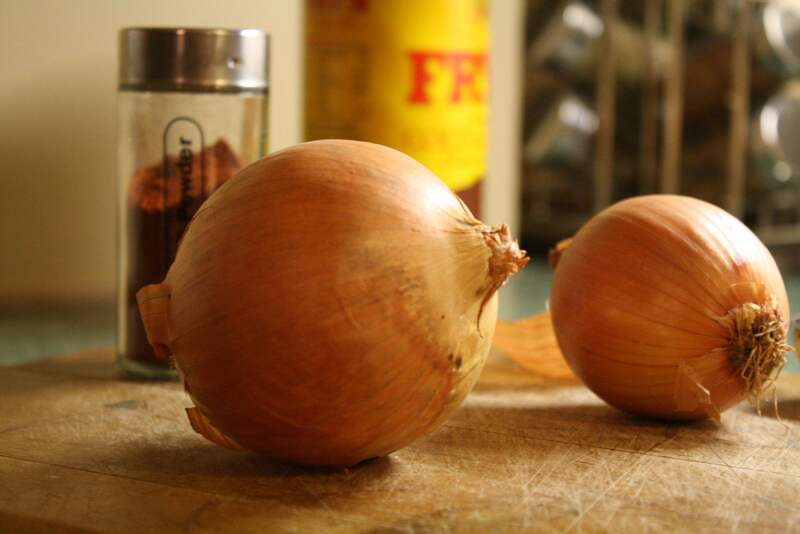 Chop the onion finely and add to the chicken. 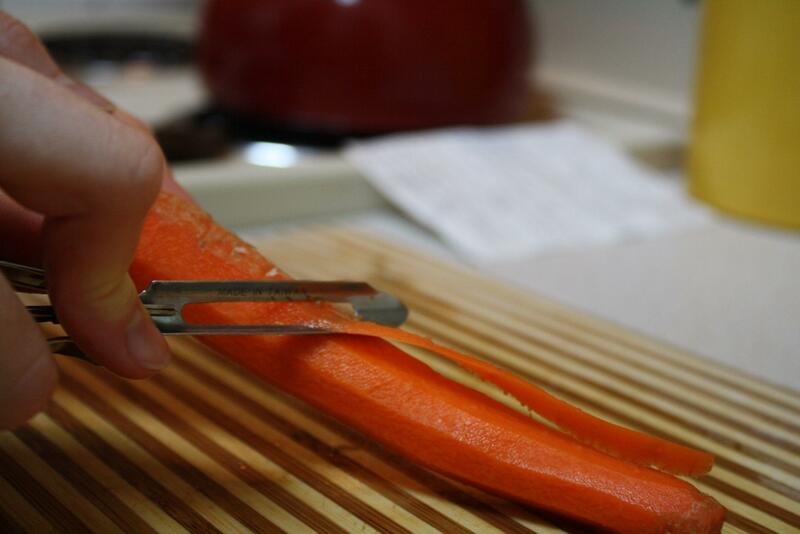 Cut celery and carrots into large chunks and add to pot. Peel garlic cloves and add, whole, to pot. Pour in the cold water to cover and bring to boil over medium heat. Simmer on low heat for two hours, partly covered. After one hour of simmering, add salt and pepper. 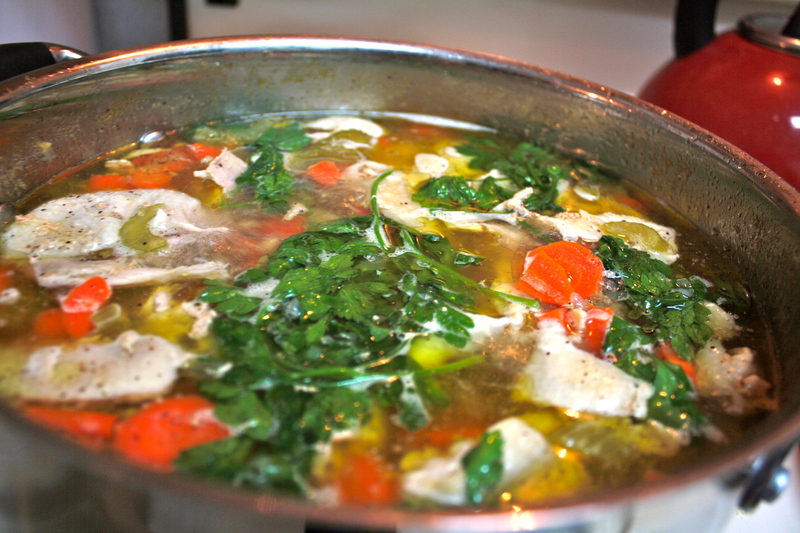 If the broth could use more flavour, add a packet of chicken stock until you’ve reached the right taste. Remove the stems from the parsley, rinse, and add to soup. At the two hour mark, use a colander to strain the soup into the other large pot. Skim most of the fat (clear, oily substance) off the top of the strained broth with a spoon. 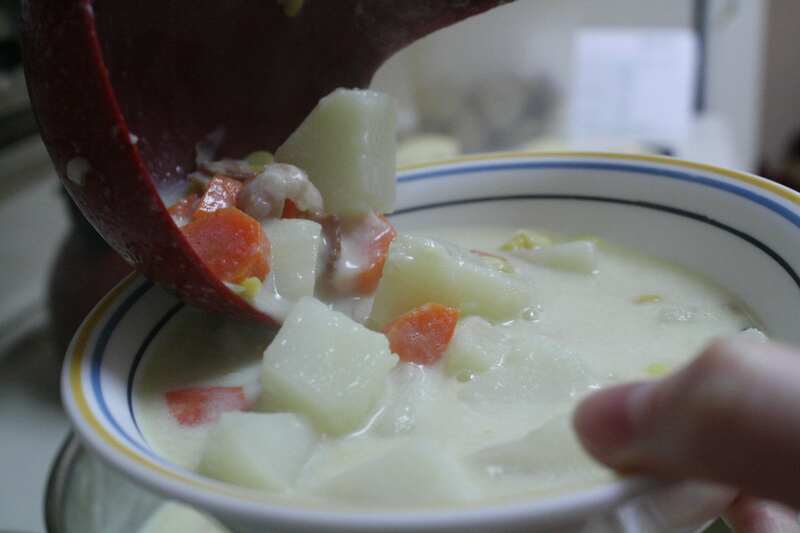 Remove the carrots and celery from the colander and chop them into bite-size pieces before placing them in the strained broth. Select chicken from the colander (as much or as little as you want) and place in in the broth. Stir. Cook rotini noodles separately in a pot according to the package directions. Once al dente, strain noodles and add to soup. Stir thoroughly and serve.